Resolutions and decisions of the Economic and Social Council (ECOSOC) were not published as individual documents until 2012. Resolutions and decisions are numbered and published in annual compilations. Since 2001, the ECOSOC website has provided the text of individual decisions and resolutions. These appear without symbol or masthead and are not official documents. 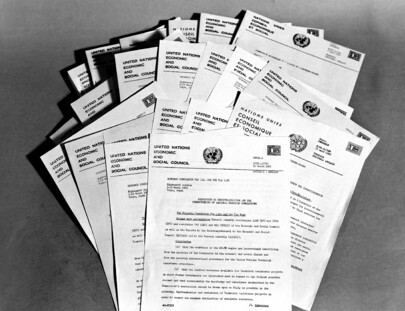 In 2012, ECOSOC resolutions began to be issued as individual documents. From 1946-1977, the first 2,130 resolutions adopted by the ECOSOC were consecutively numbered. In 1975, the resolution adopted during the organizational session was identified by the designation (ORG-75). Since 1978, the number of the resolution follows the year. Since 2012, ECOSOC resolutions have been issued as individual documents. Before 1974, decisions of the Council were not numbered. From 1974 to 1977, the decisions were numbered consecutively and were identified by a system identical to that established for resolutions adopted during the same period. From 1975 to 1977, decisions adopted during the organizational sessions were identified by the designation (ORG-75), (ORG-76) or (ORG-77) following the sequential number. From 1978 on, the pattern for numbering decisions of the Council is similar to that of resolutions.